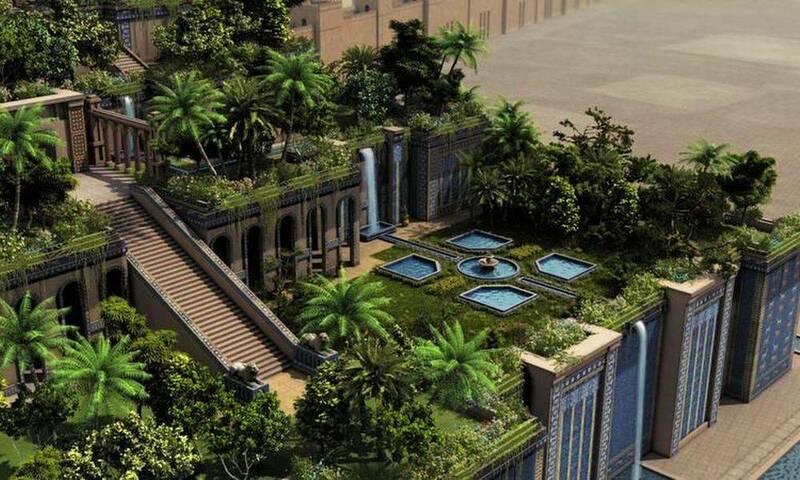 The hanging gardens of Babylon are a set of gardens located in the ancient city of Babylon, Iraq. The main difficulty encountered in their subjects is the lack of documentary sources. The documents that have come down to us are not only rare but unreliable because they are systematically testimonies, that is to say, narratives drawn from documents prior to their writing. If we add the unfavorable historical context for the preservation of oral or written information (This region of the world has often been unstable, and for long periods of time), and the rumor transmitted orally from a mythical place where a garden would be suspended in the air, one obtains all the favorable conditions for not being able to describe a monument 2600 years old. Yet these documents associated with archaeological research - rather unsuccessful - make it possible to estimate what they looked like. But before that, we must speak of the Greek and Roman authors on whom the specialists base themselves. There are 5 documentary sources on the gardens of Babylon. Two are particularly well-known: that of Flavius Josephus, a Roman historian of the first century, and that of Diodorus of Sicily, a historian of the first century BC. The others are the Strabo geographer in the 1st century BC, Quinte Curce, Roman historian of the 1st century and Philon of Bysance, from the 3rd century BC. Historians constantly ask themselves the question of the reliability of their respective writings, since each one may have divergent interests but especially erroneous information. However, it is on the basis of these five authors that the following description is based. Above all it is necessary to know that the word "suspended" makes no sense when talking about gardens. These gardens were not suspended, they could not have been, given the weight they represented. This expression comes from the description of Philo which delivers more an irreal image of the monument than a real description in his book, "De sept orbis spectaculis". He describes a garden floating in the air, and it is this image that strongly marks the spirits that has spread to us. In reality they were high, on a building, which gave them the impression of a floating. If there is a common point between the different descriptions, it is that these gardens were installed on a structure built by man, so high. The plan was square about 120m side. From the floor of the columns kept a ceiling above which the gardens were installed. These columns are not safe, it was possible that they were simple walls, thick and solid, but the columns are much more likely because they made it possible to make a vault - described by Strabo, the only author to do so. And we know that the vault allows to distribute the loads on the columns much better than if the ceiling had been flat. In fact, a flat ceiling is simply impossible, the load was too heavy for the whole I held upright. Yet this is what Quinte-Curce describes (a stone ceiling above which the earth was spread out). Underneath, there was a vast room dotted with columns very close together, extremely dark. This room, according to Diodorus of Sicily, was used to store things, it was a reserve. The German archaeologist Koldewey who carried out several excavation campaigns described this room as being divided into 14. The material used is the brick for Strabo, it is in accordance with the habits of the constructions of the time, for the Babylonian civilization. On the other hand the others quote the stone, a material much less used. Above the ceiling there was a succession of terraces. The number of terraces is unknown, some representations of the nineteenth century show 6, but this information is not based on reliable data. However, since this monument has been represented, it is done with several terraces. Note that in ancient Greek grammar distinguishes between uniqueness, duality and multiplicity. 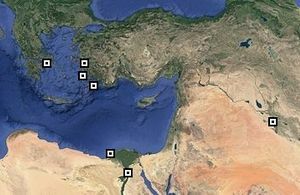 Now in the texts the Greeks use multiplicity, proof that there were at least three terraces. All the terraces had to raise the building to a certain height, impossible to say today. Quinte Curce estimates the summit at the height of the ramparts of the city. One is willing to believe it but one would have to know the height of the ramparts of Babylon because Strabo and Diodorus fixed it at 22m and Herodotus at 100m, which is abberant but marks above all the lack of reliability of the information of the time. None of the authors provide information on the gardens themselves. A description indicates that the terraces were covered with a forest of trees, but this is the only indication that one has, and again as long as it has not been cross-checked with other documents, or with archaeological findings this is not reliable. We do not know the tree species planted and how the gardens were structured. Were they doped gardens or, on the contrary, simulated nature? The garden probably required a lot of water. This one was brought by a mechanical system (always to take to the conditional, it is not sure). According to Strabo it would be a worm driven by men. The water came from the Euphrates by an ingenious system of pipes. Here is the description of Strabo, Greek geographer of the first century, in his book "Geography", Volume XVI. This garden, an immense square of 4 plèthres on the side, consists of several tiers of terraces supported by arcades whose vaults fall on cubic pillars. These pillars are hollow and filled with earth, which has made it possible to bring in the largest trees. Pillars, arches and arches were built only with fire-bricks and asphalt. We reach the upper terrace by the steps of an immense staircase, along which have been placed slugs or hydraulic screws, designed to raise the water of the Euphrates into the garden, and which operate without interruption, effort of men committed to this care.